Baby girl dresses that will wow the new mom. We are acutely aware of how fast babies grow and for that reason, we make this baby girl dress not only super soft and stretchy, but with a little growing room added in. A perfect gift for that special new arrival. Our special reversible style is really 2 designs in one. She can wear it with the ties in the front or back and each side is completely different to match her changing moods. They also come with adorable contrasting bloomers. 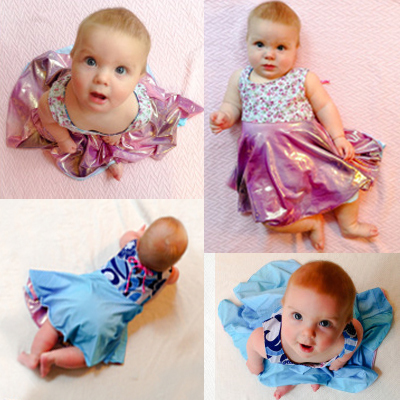 Because they are reversible, these baby girl dresses make the perfect shower gift. They are so adorable and unique, everyone who sees it will ooh and ahh. And they're practical too. If she gets one side messy, just flip it over and have her wear the other side one. And believe me, once she sees how cute it is on her, she'll start drooling. All of our girls baby dresses are proudly Made in America, using the softest fabric and highest quality stitching. Care is super easy. Just toss in the washing machine and tumble dry low or line dry. Easy as pie! She may be too young to twirl, but she'll definitely twirl on the inside when you but this dress for baby on her. It's almost as soft as her skin! All of the itchy seams are sandwiched so they don't touch her sensitive skin. And if she has a big sister, we offer similar dresses. Perfect for a photo opportunity. You can frame it or make it wallet size, so that it's always close to your heart. That's how special it will be to you and your whole family. Our baby girl dresses make the perfect "First Twirly Dress" gift, it will be a sure candidate for the keepsake treasure box. Many parents tell us that they can't bear to part with these dresses for baby girl once they outgrow them. So keep them in her memory box so that years from now you'll look back fondly and wonder how she ever that small.